VALDOSTA — Beginning with the 2015-2016 academic year, Valdosta State University now offers in-state tuition to all residents of South Carolina, Florida, and Alabama who meet the requirements for admission. This is just one more way the university is realizing its commitment to innovative efforts that improve access to top-quality public higher education. The Board of Regents approved VSU’s request to offer unlimited out-of-state tuition waivers to residents of the three border states on Monday, a move that further defines VSU’s role as a true comprehensive university with local, national, and international appeal. Previously, the university only offered unlimited out-of-state tuition waivers to residents of Leon, Jefferson, Columbia, Baker, Hamilton, Madison, and Nassau counties in Florida. 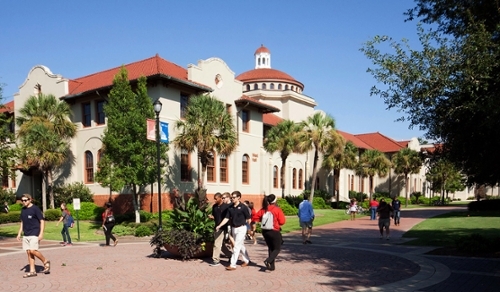 “This change in the out-of-state tuition policy provides a great opportunity for VSU to recruit in one of the closest major metropolitan areas — Jacksonville, Fla. — a city where many of our alumni reside,” said Andy T. Clark, vice president for the Division of Enrollment, Marketing, and Communications. Limited out-of-state tuition waivers remain available for international students and residents of the remaining 46 states and Washington, D.C.
Valdosta State University offers both the extensive academic, cultural, and social opportunities of a major university and the small classes and close, personal attention of smaller institutions. It boasts more than 100 degree, certificate, and endorsement programs on campus and online for undergraduate and graduate students. It also has a full menu of extracurricular activities, from national championship baseball, football, softball, tennis, and even debate, teams to honors organizations, sororities and fraternities, intramural sports, academic and service clubs, a symphony orchestra, art and theatre, research opportunities, and more. Even as underclassmen, students file patents on inventions and make life-changing scientific discoveries, present at national and international conferences, publish research in collaboration with their professors, work in campus-based clinics that benefit the community, live and learn at partner institutions around the globe through study abroad — the possibilities are endless.